I am a teacher and have a list in Excel of 225 “sight” words. I would like to import these words into a PowerPoint presentation with one word per slide so the kids can have electronic flash cards. Is there a way to do this without retyping each word? Kathy Jacobs, another PowerPoint MVP answered the post – this is included here with her permission. Thank you, Kathy. 1. Save your Excel file as a text file – choose File | Save As… and choose Unicode Text (*.txt) as the File Type. 2. Open the text file in Notepad or another text editor to make sure that each word is on a separate line. 3. Launch PowerPoint and choose File | Open. In the File Type drop down menu, choose All Outlines so that your text file can be selected. Click OK. Tip: To change the look of the presentation, apply a template. 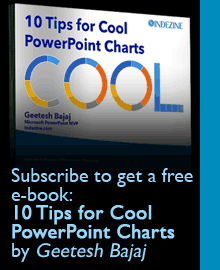 You’ll find several free PowerPoint templates on Indezine. « How Do I Loop Sound/Music for a Looped Presentation?